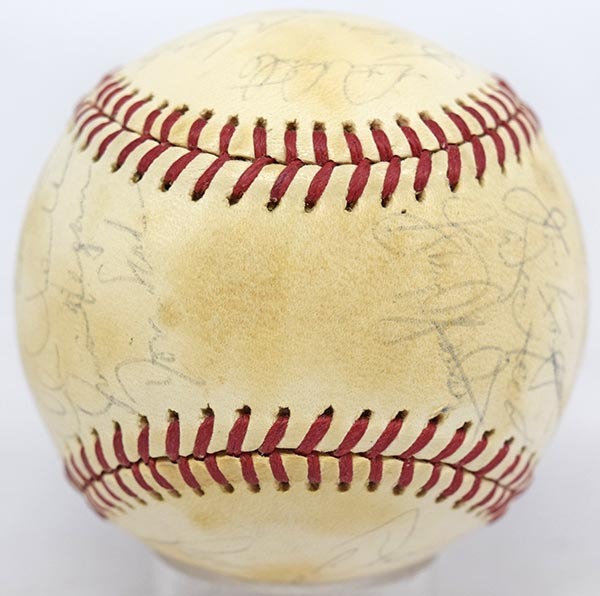 One of the toughest of all Yankee team balls, how often do you find a 1979 with a real Munson? Thurman tragically died in a plane crash in August, he had a relatively short window to sign one of these, and almost all that come to market have a clubhouse Munson. The offered ball is of medium quality, with toning and slightly light signatures. Everything is fully legible however, most vitally the key Munson signature. The other autographs include Gossage, Hunter, Berra, Guidry, Randolph, White and Dent. With the 23 signatures, there are amazingly no clubhouse autographs. It of course cannot be difficult to add Reggie Jackson if desired. Who wants to fill an almost impossible space in their Yankee team ball run?